School is out! If your kids are already restless, Bright Lights is your answer! With many fun, hands-on activities, the options are endless. 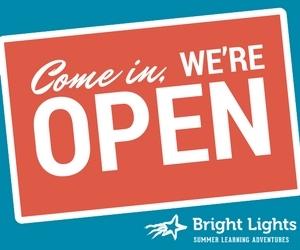 We still have spots available in a variety of our June and July classes for all grade levels. To see the full list of classes with availability, simply go to Register on our home page. Sort by grade level and/or week to narrow down your choices. To find a description of the class, click on the class title. Select the “Add” button and the class(es) you are interested in will be added to your cart. Click through the remaining registration screens, and you will be on your way to getting signed up! •	If you want your student(s) to have an all-day experience, you can choose one of our full-day camps OR you can choose a morning class taking place at Holmes + lunch care + an afternoon class taking place at Holmes and they'll have fun from 9:00 AM - 4:00 PM all week! •	And if you need to start the day a little earlier, just add on our Before Care option which starts at 7:30 AM at Holmes.